So, last week I found myself without my mobile phone for five whole days. “Somehow” the screen got cracked, rendering it completely useless until a repair shop could get the right part and fix it. Utterly unprepared, I found myself thrust into a world without data packages, instant text messaging and social media at my very whim. A world that I have grown unfamiliar with. For five days, I had no more games, emails, weather reports and calendar appointments to check from bed, in waiting rooms or at stoplights. I couldn’t take an instant picture whenever I wanted, call a friend if I needed or get quick directions on the fly. It made me realize just how dependent I am on such a fragile technology. That in an instant, I could lose all access to my “cloud,” my daily planner and countless pictures and videos that I had saved in that little 3×5 black hole. For five days, I used my husband’s phone to make calls, I hand-wrote all my appointments for the day, complete with addresses and directions, I used only my laptop for checking Facebook, emails and the weather. And for five days, I was transported back in time, to where things were just a little less plugged-in and a little more simple. I’m always inspired by reading blogs on living unwired and hands-free or the wistful historical fiction and Amish fiction novels which describe living a little slower, without power and all the technology that make our lives today so fast-paced. It reminds me of a simpler time just 20 years ago, being raised in the country without the internet, cable television or a million hand-held devices. Sure, we watched a lot of TV (all six channels that we had!) But we also played outdoors on my parents’ vast eighteen acres of hills and old-growth fir trees, using our imaginations and reading books. Even seven years ago when I began having my own babies, Facebook, Twitter, Instagram, Pinterest an (gasp!) blogging didn’t consume hours upon hours of my day. I didn’t even have a data package on my “smart phone” blackberry. I “blogged” by writing each day in the stained, yellowed pages and fading ink volumes that I’d been keeping since the 5th grade. I feel like I have made feats to bring myself back to a simpler life in some ways. I am a full-time SAHM; we’ve used cloth diapers on all three of our babies and I homeschool our preschoolers. I have a huge garden where I spend most of my springs, summers and early falls and then preserve much of its produce by canning, freezing and drying for the winter months. We don’t have AC in the house, so on warm, summer days, I despise the hot clothes dryer heating up our home and hang much of our laundry on a line in the backyard. I also enjoy making most of our meals from scratch, with fewer ingredients like bread, cakes and casseroles, rather than from a can or box. So, five days after the “black-out” I had my phone back in all it’s glory…along with three missed calls, two voicemail messages and ten unanswered texts, but I had a new resolve not to allow myself to get too attached or dependent on this fragile devise. Because even though we have in-home Wi-Fi for our laptops, smart phones and iPad and own nearly every Disney movie ever made on dvd, it is still important to me to have a healthy balance of an unplugged life, full of the richness, innocence and beauty that sometimes only the “old-fashioned” things can offer…and that a shattered screen cannot take away. And I hope to instill in my children that despite the modern conveniences of this world, we can still live in moderation and keep some things in life a little simpler. This is a great post! I don’t know what I would do without my electronics, scary, huh!? Your post definitely resonated!! It’s funny how somethings just start to almost take over our lives. I find that though I think I’m away from my phone (and often am) for quite a time, the access to what’s out there is important. I love having the internet, because it helps me to learn and also connect with others. I long for a bit more of a simpler life. One where I can hang clothes to dry, open windows to let the breeze in, play in the yard, cook all from scratch, have a garden, and read books under the trees. We’re inching closer and closer. I think even then, I’ll still like the occasional connection I can get through my phone….for those times I’m not at home where I’m comfortable and I have to interact with those more readily connected and not slower. Swinging by from Turn It Up Tuesday! Well said. I learned a lot about the technological conveniences from you as I gleefully lagged behind. Although it may not be hip, it is nice to be old fashioned in the high-tech world that we live in. There are some great aspects to the instancy of it all, but I could still gladly trade it in for the days when we wore our bandanas and overalls to flag newly planted trees on the back 18. To be intentional as a mom, we have to put aside our electronics and the “things” that consume us and focus on the relationships more. I left my cell phone at home (on accident) while we were at the beach for a week. It was the best vacation of my life. I had ZERO distractions and focused on my family! What a great post…so many things I can relate to! I just found your blog on the Time For Mom blog hop and I can’t wait to read more! Wonderful post and very well said. I think relationships suffer when we are plugged in to technology. 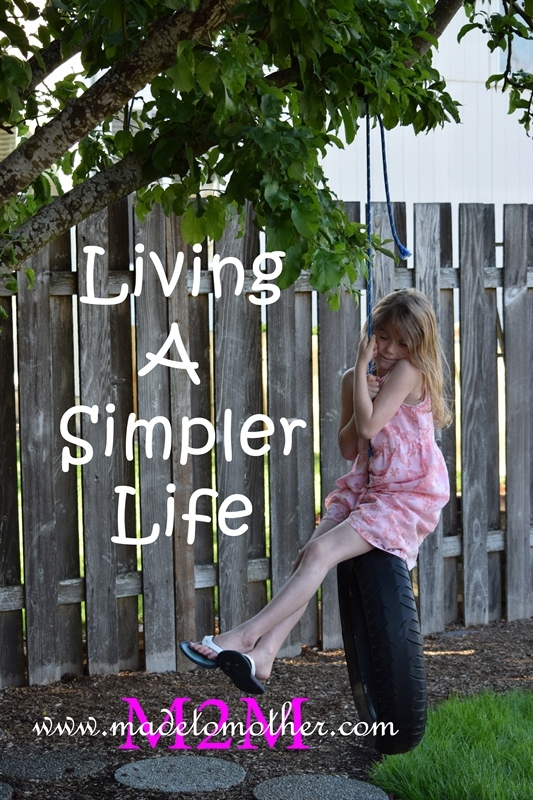 It’s liberating to be simpler. I’m delighted that you linked up this post to the #SHINEbloghop! Good luck with your goal – it’s certainly a worthy one! I realized how dependent I’d become on my computer when it wouldn’t work and I felt lost. This is something I’ve been working on too! I love this post! I think technology and both enrich and destroy our lives, so moderation and balance are key. Sometimes we need a tragic disaster (i.e. broken phone) to snap things into perspective for us. It sounds like you have a growing awareness of yourself and your tendencies and that’s something I aspire to grow into! Love it! Your forced vacation is such a good reminder to be mindful and present in life right now!!! I’ve been noticing more and more people watching their phones while they walk the dog and it makes me so sad for they are missing life! So thanks for reminding me to put my phone down, step away from the computer and enjoy life around me. This definitely hits home with me. It is crazy to think about how and why we are so attached to our little devices. It’s a reminder to myself that I need to set a limit- especially since I am also a SAHM with a little one. Sometimes I feel I am missing out on too much because I am too concerned about emails, texts, etc. Thank you so much for posting this and linking up at Let’s Get Real! Great post! So glad to have found you via link up party @ Create with Joy! What a great reminder that life does go on when we live it simply…we can survive without technology! Beautiful post! And how true! My husband and I no longer have our phone at all, and while most people would gasp, shake their heads, and call us Luddites; we have discovered that life actually can slow down a bit. We just have to be willing to go through the temporary period of adjustment where you feel like a fish out of water. We went through the same awkward time period when we got rid of cable by going to streaming t.v. as well. We home school also, and continue to try to figuire gardening out. We don’t have facebook, and for us, life feels a whole lot better from down here. Beautiful post! There are so many things screaming for our intention. I have to work hard to stay balance with blogging and social media, and I often don’t make the best choices. They do have their good points, but I do long for simpler times without all of the distractions. Thanks for sharing at The Weekend Brew. I love that Miranda Lambert song . . . but I also love what technology has to offer! Thanks for sharing this. I enjoy your M2M stories, but it’s also fun to get to know you a bit, Wynter! I’m your neighbor at Salt & Light. Blessings! Due to finances and lack of need, I only have an emergency cheap cell phone. I can barely text a readable message. I’ve been lamenting about it and throwing hints to my husband about how I need to “catch up” with all of the other moms around me. Perhaps I need to re-think it! Thank you for inspiring me to long for the simple. Very well said. I’m striving to limit my technology. Thankfully I don’t have a mobile phone so that helps a lot. I know, right? How did we fill this time without all that stuff? The mind boggles! Great post. Great post…I spend a couple days each week unplugged and it has made a huge difference in my life! I need to unplug once in a while. I find myself checking twitter and instagram constantly, multiple time a day. I do spend times without my technology, like swimming in the pool, or cooking meals. It is nice to remove myself from technology and just live in the moment. Great post! I cannot tell you how much I love this post and how true this rings for our family as well. We prefer pretend play, bike rides, and working in the yard to TV or video games. We love entertaining friends and love doing game nights with guests! These are the things I want my kids to know and remember… that mom & dad took time for them, played with them, and asked them about their day rather than living behind the screen of a computer or phone. Thanks so much for sharing on Makeovers & Motherhood’s Welcome Party Wednesday Link-Up. Featuring you this week! soo…i love it when we are “forced” to learn something. i’m reading a great new book: soul keeping, by john ortberg – i would keep my soul in better health if i’d break my phone for a bit. thanks for linking on welcomeheart today! I am making such an effort to leave my phone at home more often, especially when I am taking my kids to the park or for a walk so that I can focus on them, not the device. Thanks for sharing this! browsing your weblog posts. In any case I’ll be subscribing to your feed and I hope you write again soon!